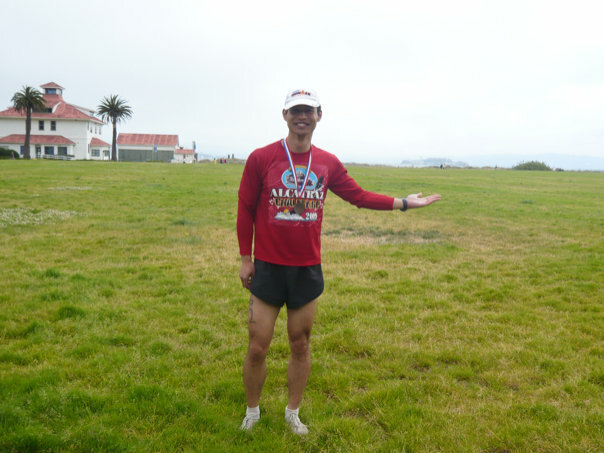 There were several reasons the Alcatraz Challenge was on my long list of things to do before keeling over and becoming a decomposing, inanimate corpse. 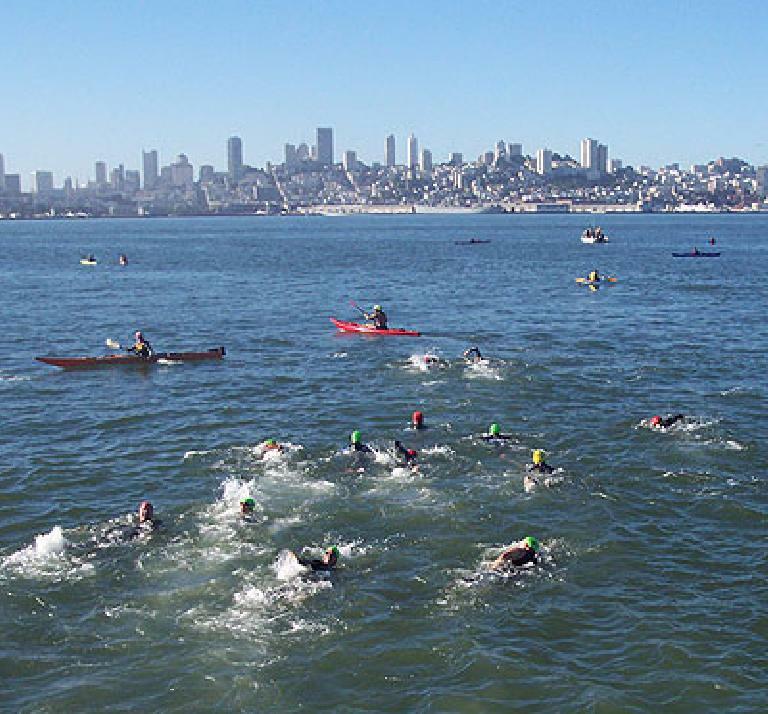 I wanted to do an open saltwater swim at least once in my life, and there was the cachet of “escaping” from the supposedly inescapable island of Alcatraz, the former site of a maximum-security U.S. military and federal prison. 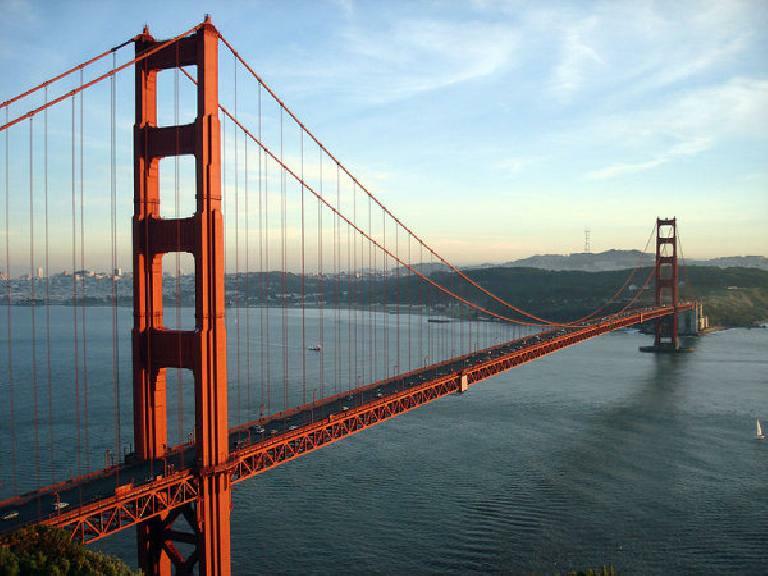 Swimming towards the city of San Francisco was also sure to offer an unparalleled perspective of its skyline. But the greatest motivator was a 2006 newspaper article about a seven-year-old boy successfully swimming from Alcatraz to SF. Seven years old! If a second-grader just a few years removed from diapers could do it, I thought I certainly could. Never mind that (as well-chronicled on this web site) I am able to swim only marginally better than a fish can fly. 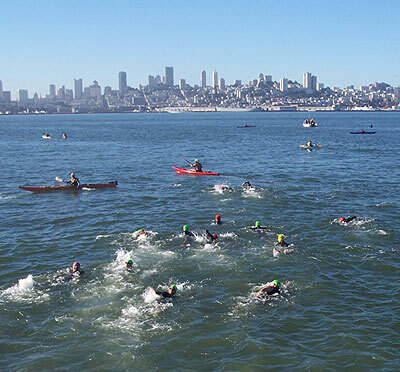 But I have swum farther than 1.5 miles (the distance from Alcatraz to SF’s Aquatic Park) before, and registering for this race would compel me to work on my swimming abilities so that I would be a little faster than an amoeba. Or so I thought—I ended up practicing only a dozen or so times, sometimes in Fort Collins’ Edora Pool, other times in Richards Lake by my house. Greater concerns included frigid waters, strong currents, choppy waves, jellyfish and sharks. My pre-race jitters were somewhat allayed on race morning when I heard that the water was a tepid-for-SF, but-still-cold 62 degrees, and that there had never been a shark attack here. My wetsuit would help protect me from stinging jellyfish nematocysts and if I was on the verge of drowning, there were boats and kayakers nearby to provide assistance. The minutes before jumping into the water a few hundred feet off the coast of Alcatraz gave me flashbacks to my skydiving experience as I witnessed people casually jumping out of our safe vessel (in this case, a ferry) before the big moment. But here it was “swim or die.” As a concession to my slowness compared to the “real” swimmers here I waited in the rear of the line. Some eight minutes after the first swimmers had already started stroking, I leaped out of the ferry and was immediately pleased that, yes, as reported, the water did not feel as cold as a Slushee. Not warm, mind you, but comfortable. I aimed for the gray Fontana Apartment Towers behind a thick bank of fog for the first 15-20 minutes, as slow swimmers were advised to do. The towers were well left of the Aquatic Park finish but the current would carry us right. Within these minutes I experienced some moments of discombobulation as sometimes when I’d turn my head to breathe I’d get pummeled by a wave and a mouth full of salty sea liquid. The waters were choppy—choppier than in previous years I was told after the race. Most of the other swimmers quickly got way ahead of me, and I regretted starting at the back as it meant that I spent the majority of the swim swimming almost alone. But after about 20 minutes the waves calmed down and I could clearly see the orange dome of the Palace of Fine Arts. I aimed for that until Fort Mason approached. A little while later I noticed the red flags in the distance signifying the end of the swim at Aquatic Park. Then I could make out the beach where spectators were cheering. As usual, the sight of the finish line sent adrenaline surging through my body and I started to kick harder and stroke faster. By the time I was able to get my feet under me and safely onto sand over an hour had elapsed since I jumped off the ferry. Mission accomplished. Well, almost. There was still the matter of the run as I had registered for the aquathlon version (swim + run) of the event. So I stripped my wetsuit off as quickly as I could and was in my Puma Salohs quicker than you can say “Golden Gate Bridge.” Which was what I’d be running up towards, over, and back, offering commanding views of Sausalito, the bay, Alcatraz, Angel Island, and on the return, San Francisco. The run course was seven miles and included a series of stairs up to the bridge and hence was pretty hilly, but I still managed a 6:57/mile pace and passed at least 100 racers and many more tourists which I had to weave around. But as beautiful as the run was and as good as I felt, it was anticlimatic since I entered the event primarily for the swim. Three years after reading about the seven-year-old swimming from Alcatraz to San Francisco, I was able to check it off my bucket list. Never mind that the seven-year-old did the swim in 47 minutes while it took me 72. Yes, I would have gotten schooled by a second-grader. Guess my swimming could still use a lot of work.